Phantoms in the Brain is a collection of essays about the more exotic kinds of abnormal psychology, the kinds of bizarre behaviors that can sometimes result from strokes and traumatic brain injuries. If you are thinking “Oh, Oliver Sacks,” then you are correct: this book covers very similar ground to many of Dr. Sacks’ essays (collected in popular books like The Man Who Mistook His Wife for a Hat) and he is mentioned frequently in its pages. Dr. Ramachandran (probably second author Blakeslee from Ramachadran’s instructions, of course, but we’ll follow the conventions here) begins the book by talking about his research in phantom limbs. Working with the kinds of patients who feel excruciating pain in a leg that was amputated years ago, or who baffle people by pointing and gesturing with an arm that was lost in a long-ago accident, Ramachandran pursues two parallel lines of thinking. First, of course, he tries to come up with ideas that will give his patients relief. Second, he wonders what is happening neurologically to give people with phantom limbs a contradictory internal body map. What we learn is that an individual’s conception of his or her own body is in fact a complicated business. We get a sense of this as we move past phantom limbs to much stranger phenomena like, for instance, the inability of some stroke victims to realize that they are paralyzed, or the inability to recognize the left half of one’s body as one’s own (“That must be my brother’s arm,” says an otherwise perfectly intelligent and sane person, looking at her left arm. “I have no idea how it got here.”). Ramachandran comes across as a pretty gung-ho sort of guy. To probe the details of patients’ misconceptions about their own bodies, he devises all sorts of ingenious tests and therapies. He keeps it real, low-budget, and actively experimental: his therapies involve lots of cardboard boxes, mirrors, pencils, insightful questions, and on more than one occasion graduate students hiding under the table. What he is able to demonstrate is that our grasp of our own bodies, like everything else in our experience, relies on a brain that is a much messier organ than scientists used to realize, and a much, much messier organ than most people are entirely comfortable to find out about. In case you missed the memo: Nothing like a single unified entity, your brain is an evolutionarily cobbled-together contraption of a zillion or so overlapping, often mutually antagonistic, systems, the vast majority cranking along and doing their own esoteric business without us ever being aware of them. Our brain is like the most complicated of modern jet aircraft, except exponentially more complicated, and consciousness, the alert little ghost we usually think of as our “self,” is at best one of the pilots – although a coach-class passenger, a flight attendant, or the aircraft controller on the ground might all be more accurate analogies. The data is still coming in. 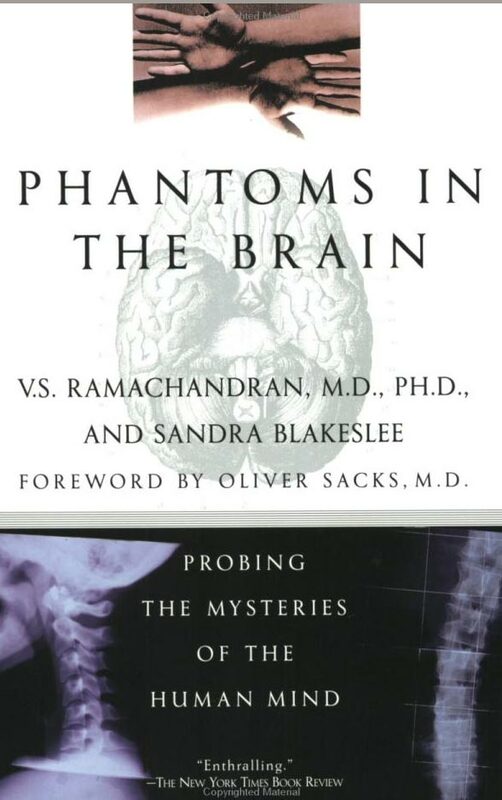 Specifically, Ramachandran shows pretty convincingly that phenomena like phantom limb syndrome are a product of two different body-awareness systems, both pre-conscious, falling out of alignment with each other. And by “pretty convincingly” I mean that he is actually able to use his theory to cure people – he’s able to make phantom limbs go away. He also gives step-by-step instructions for how you too can give yourself a phantom limb, or become momentarily convinced that your nose is several feet long, or – under the right circumstances – how you can briefly give yourself the very strong impression that a table is part of your body. It’s crazy stuff, and I say that very admiringly. Ramachandran is a slightly less elegant writer than Sacks, and he sprinkles the book with jokes and gags that are probably gold from the lectern but are a little corny on the page. I like him, though, for his more aggressive pursuit of what the findings of abnormal psychology imply for normal psychology and the workings of the brain. It’s bracing stuff right up to the final chapter, in which he attempts to address head on the whole question of consciousness and what makes it tick. This, unfortunately, is a bridge too far. His empirical work has done a lot to explain certain specific aspects of how brains work and what that means for those of us who live inside them, but his leap from there to The Big Question is pretty tenuous. You can understand why he would want to give it a shot, but it’s a minor shame that it has to come at the end of the book, where it takes some of the glow from everything that came before. it's true ramachandran is no oliver sacks; he doesn't seem to have the same empathy sacks does, so his writing feels somewhat smug. but reading this book makes me question consciousness & my own self-pereption. the "unconscious zombies" concept is really freaky when i spend any time thinking about it. blindsight, for instance. My feeling for the moment is that Sacks is the better read, but that Ramachandran extracts more significance out of the material.